The Li trigram (fire in the eight trigrams) is used in the middle school of Neidan meditation to explain the relationship between consciousness and emotion. Li is recognized as “Shen” or the human spirit emerging from the heart. It is made up of two solid outside yang lines representing “Xing” or natural human consciousness and one broken Yin line representing “Qing” or emotion. In the Southern School document Understanding Reality, Zhang Boduan said “When the two natures (yin and yang) come together, Qing and xing are harmonized.” The middle school Theorist, Li DaoChun espoused the idea that if the Consciousness were kept absolutely still, the emotions would go into emptiness and the mind would revert to a state of pure Yang energy. Since Yang energy is considered to be generative in Daoism, then this is considered to be the correct method of practice. In other words, by submitting the mind to silence, it is possible to maximize yin energy, forcing it to go to its natural extreme and convert to yang energy, thus regenerating the body and mind. section from golden elixir question and answer. question: what is the stove? answer: the highest level elixir method uses the “Shen” (consciousness) as the stove, the “Xing” (natural consciousness) as the medicine and being set as fire. Chinese tea can seem very daunting at first. There are many different kinds and seemingly infinite gradations of quality for each tea. This next series of blogs seeks to help explain the pricing of Chinese tea at wholesale market prices and how it affects the teas you purchase in store or online, as well as the end quality of tea you receive. This series of threads will start with green tea! These teas vary in length, but are typically medium sized, flat, and stiff before brewing. Tipped Green Tea: tips come in many forms and typically they are endemic of first harvest high end green teas. Any tea can be made as tips and long jing, mao feng, and mao jian tips often sell for very high prices, or are sold very quickly to business people and government officers. Many tipped teas become available on the regular market every year, but they are often not sold outside of China, simply due to reasons of pricing and practicality. Wire form green teas: green teas in the shape of wire are often simply longer versions of famous tip teas such as Mao Jian. They come in many different qualities and usually the shorter they are, they better they are. Very long wire shaped teas longer than an inch are typically more acidic than shorter ones. “Jian” style tips: Jian style tips are the very short tips, mainly made of wire shaped tea leaves, but also applied to dragon well and other green teas. They are typically considered to be the highest quality of green tea. Rolled green tea: teas such as bi luo chun which are rolled into a loose coil form. Large form green tea: These teas really only fit into the classes of Tai Ping Hou Kui and Taiwanese green tea. Hou Kui is the only one of the two which can be truly considered to be green tea, since Taiwan green tea is often made with oolong leaves. Hou Kui is considered to be very high quality, but there are many fakes on the market. Green tea at wholesale starts at very low prices and goes to very high prices. Prices are determined by terroir, leaf picking quality, size of leaf, freshness of leaf, taste, shape, completeness of leaf and many other things. Typically, any tea grown in its most famous geographical region (for instance, long jing tea grown in hangzhou) is more expensive than tea grown in less famous regions (long jing grown in fujian province for instance). This means that prices accord to this principle and if you want to purchase source genuine tea, it usually costs considerably more money than buying outsourced teas. This is easier for less popular teas such as mao feng, but very difficult for teas such as long jing, bi luo chun, and hou kui. since there are so many fakes on the market, these teas often require special contacts to get a real one. 40 RMB/$7 USD – 500g: low end, large leaf, terroir non authentic tea. usually very high in farm chemical residue. 100 RMB/$15 USD – 500 g: large leaf, terroir non authentic, mildly acidic, usually using farm chemicals. 200 – 400 RMB/$30-60 USD – 500 g: medium sized leaf, terroir non authentic, usually tastes sweet and reasonably good, usually using farm chemicals. 500-700 RMB/$75-100 USD: small leaf, terroir non authentic, usually very sweet, farm chemicals typically used. 1000 -1500 RMB/ 500 g: smallest leaves terroir non authentic, using good soil and plucking standard, or medium sized terroir authentic, very sweet, often containing hidden flavours in the aftertaste. Very easy to damage with hot water. 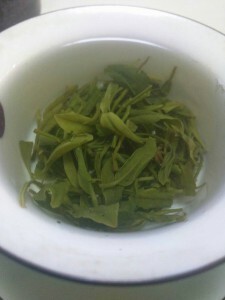 2000 + RMB/500 g: very high end tea, often terroir authentic. The best teas often sell for up to 10,000 RMB/500 g and are not easy to get unless you have special contacts. As you can see, green tea prices often vary greatly depending on authenticity and leaf size as well as flavour. Teas can literally cost anywhere from $5/lbs all the way to $2000/lbs. Most major tea companies in North America and Europe buy their tea at very low prices and in large quantities. Typically, the tea is drinkable, but not good, and often from very dubious factory farms which are poorly regulated. Family tea shops are also usually no better, although sometimes in larger urban centres it is possible to get high quality tea from specialist tea shops. There are also many online shops that specialize in high end teas, although very few break the $0.5/gram threshold at wholesale, so you are more than likely going to be drinking teas which originally fall into the framework of $10-$100/LB, with better tea shops offering a wide range of qualities in the same tea. In order to get good green tea, just as with any other tea, you need to shop around, find stores you like, and ask questions, as well as drinking lots of tea. Try not to be satisfied with the teas you have already found and always seek to research more deeply. Maybe you could even plan a trip to some tea fields in China to do research on site, first hand. Saturday June 16 2017 please join us for a special week long self cultivation and tea adventure in beautiful Taiwan. 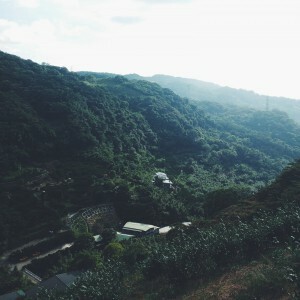 -Muzha: the home of Taiwanese Tieguanyin iron goddess tea and four seasons spring. – Lugu: the base camp township of the famous Dong Ding mountain (where we will visit some of the oldest tea farms in Taiwan). – baguashan: a famous tea farming area in Nantou county, Mingjian district where we will visit a wonderful permaculture organic tea farm. – Yingge: the most famous pottery making district of Taiwan where we will visit various potters and the famous Taiwan Ceramics museum. Every day twice a day we will have meditation and Qi gong sessions as well as daily tea sessions, classes in Taiwan tea ceremony, and some chances to meet tea and pottery masters from Taiwan. Saturday June 16: arrivals, we will meet in downtown Taipei at a guest house near the central rail station (airport pickups can be arranged before hand). Drink some tea, chat, eat some dinner and off to sleep. Sunday June 17: wake up for a 9 AM meditation sitting and breakfast at the guest house. 12 PM head off the Muzha Mao Kong mountain area and visit various tea houses and farms there to sample the local tieguanyin tea. 6 PM: visit a famous tea house in Taipei called Wysteria, one of the hot beds of tea ceremony culture in Taiwan. Have dinner and tea there. 9 PM: back to the hotel for an evening meditation sitting and off to sleep. Tuesday June 19: Wake up for an 8 AM sitting, 9 AM eat breakfast, 10 AM – noon, free time. Noon, Go to Dong Ding and visit various tea farms there. Late afternoon, back to the guest house and drink tea with Mr.Xiao. Wednesday June 20: 8 Am sitting, 9 Am breakfast, Free time till noon. 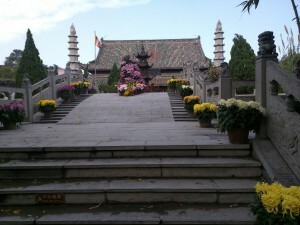 A possible visit to see Master Deng, a local pottery and Cha Dao master. Afternoon, visit around Lugu to look at local tea shops and the Lugu Tea Museum. Evening qi gong, meditation and taijiquan. Thursday June 21: 8 AM sitting, breakfast, and catch the bus to Baguashan to look at San Jing farms. tour of the farm for the day and a discussion about tea cultivation and processing techniques with farmer Li Minghan. Spend the night at a local hotel. Friday June 22: Back to Taipei and drop our bags off at the guest house, then to Yingge pottery district to look at pottery shops and visit the museum there. Saturday June 23: Free time in Taipei and potential for meditation, Qi gong, and taiji sessions during the day and evening. The total cost for the tour is $1500 USD (price includes Transportation in Taiwan, Breakfasts, pre-arranged restaurant trips and hotel costs but does not include airplane ticket or additional expenses) and there is a $200 discount for early bird registrations. Registration before March 1st 2017 will receive a discount of $100. The minimum number of registrants for this trip to take place is 4 and the maximum spots available is 8. Please contact me either via the site or at neidandao@hotmail.com if you are interested in attending. It occurred to me recently that it might be a good idea to make a post or two about xing and ming gong in order to introduce some general concepts about them and why their practices work in the way they do. I will probably make three posts in total over the next week or so, starting with this one, moving next to xing gong, and finally to xing and ming dual cultivation. Ming in Daoist thought is the idea of life energy. This concept of life energy has been thought about in various ways throughout Daoist history, but I personally like Wang Chongyang’s interpretation of Ming as Pre Natal Qi energy. Some other texts identify Ming as Pre Natal Jing essence, which is also a fine interpretation. The reason I like Wang’s interpretation is because he understood that pre heaven Qi has the innate prerequisite of pre heaven Jing already existing, so his assertion that Ming is pre heaven Qi also means that it uses Jing, which is the building block of life in order to manifest itself and give animation to the body. So basically, regardless of who’s interpretation you like, it is fair to say that Ming is the essential “Animus” which gives rise to our ability to take action as living beings. Chen Yingning and Hu Haiya (20th century Daoist reformers) believed that Ming was like the oil in an oil lamp, it gives people the fuel that they need to live. My own concept that Ming is the basic building material and animus of the body is basically a consolidation of these concepts into a working theory which recognizes that Ming is a principle used to explain how the central systems governing the body function in order to bring life to us. Just like any major idea in Daoism, there are practices associated with Ming and this post will attempt to illustrate some basic ones. Early Daoist books separated Ming gong and Xing gong (the practice of consciousness) quite clearly and there are many different schools of thought on how each of them are cultivated. Usually Ming gong is practiced by quieting the mind and causing the consciousness to seem to vanish. In a sense, this is like sleeping while awake, and only enough intention is required to keep the mind from drifting off, but not so much attention is needed that the mind would be artificially made alert. This natural quieting of the mind, such as that practiced in “Zuo Wang” sitting and forgetting meditation is believed to allow the body to move to the maximum of yin energy, ultimately causing the jing essence transform into Qi and circulate in the body. The explains much about the reason why so many early meditation texts in Daoism advocate that the body and mind must be kept completely still during meditation. This complete stillness is believed to convert the body and mind completely to Yin energy and mimic death. Because Daoism follows the reverse course, instead of the typical concept that life is the origin of death, Daoist meditation masters who focused on ming gong believed that imitating death could be the root of life, so therefore that assuming an unmoving, unthinking, and totally still and silent attitude in meditation could stir the life energy of the body and cause the body and mind to become illuminated and bright with vitality. In effect, this type of Ming gong is the opposite of Qi Gong, which requires the body to be in movement in order to cultivate post heaven Qi. In the next post, we will discuss Xing gong, or consciousness practice, and in the final post we will discuss Xing and Ming dual cultivation, so please stay tuned. This brief opening line from the Tai Shang Gan Ying text shows us a great deal of how Daoists understand morality. It is not that good and evil are set in concrete and absolute terms and that they are absolutely opposed to each other, but rather that people by their own deeds decide whether they choose to engage in good or evil behaviour. This decision reflects on them just like a shadow which follows their bodies and is their karma. The 20th century Daoist thinker Jiang Weiqiao said that all people know the difference between good and bad actions and before committing a bad action, their minds will naturally hesitate, in the knowledge that what they are doing is wrong. If they Choose not to act on the impulse to do something harmful, then they will go back to being of their best mind very quickly, but if they choose to do the evil deed, then when it is committed it will already be too late and they will feel a sense of shame and remorse. This and the original quote from the Tai Shang Gan Ying text show us very much how morality is viewed in the Daoist world view. Freedom of choice is available to us to do either good or bad, and it is up to us to choose which to undertake, with natural consequences staying with us long after the action is committed to. the myriad changes are born of your body. The nature of the heavens is the same as that of people. The hearts of people are the mechanism (of nature). 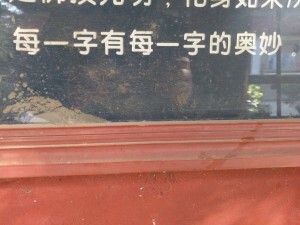 This sign at the Da Xiang Guo Temple in Kaifeng, Henan reminds us that when we are engaged in reading the classics of antiquity, it is important to spend time carefully reading the individual meanings of each word. In Daoist, Confucian, and Buddhist documents, each individual word contains a wealth of meaning and in order to extract all of the meaning from the text, we should try to read it word by word, idea by idea, subtle meaning by subtle meaning. Da Xiang Guo Temple was erected in 555 and has over 1400 years of history as one of the main Chan Buddhist temples in ancient China. It was featured in the Ming dynasty novel, The Journey West, and still functions as a place of self cultivation and teaching of Chan precepts. How Does Daoism Understand Consciousness. How Does Daoism Understand Consciousness? What is it that animates each of us and gives us our own unique ability to perceive and interact with the world. 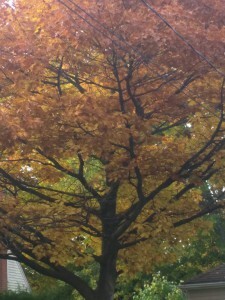 In the Daoist school, there has been an ongoing discussion on the nature of consciousness for over 2000 years and although there have been many disagreements and debates over the years, Daoism as a whole essentially came to a fairly finalistic idea of how consciousness is and how it is divided in the body and mind. Shen refers to the concept of a soul which exists inside of the body and can also be developed in such a way that it exists outside of the body. Shen is also what the Daoists use to refer to consciousness in general. Although it is important also to recognize concepts such as the spirit (ling) and masculine and feminine souls (hun and po), as well as thought (si), intent (yi), and will (zhi), the Shen consciousness is the thing which ties all of them together. Early Daoists such as Laozi did not bother to define the meaning of Shen, and the first major place in which Shen is described as being knowable is in the Yellow Emperor Hidden Talisman Classic in which the writer Li Chuan says “people know that the spirit is mystical, but don’t know that which is not mystical is actually the spirit.” This phrase basically means that the spirit is only mystical to people who don’t recognize it. To those who have experienced the spirit (in form of consciousness) there is no mystery and in fact it is simply present to oneself. the solid lines represent Yang and represent the pure “Xing” perceptive consciousness. The broken line represents Yin and the muddied “Qing” emotional consciousness. Li Daochun was the first person in Daoist history to clearly state that the Shen spirit and heart were the same entity, although conceptually the idea was already in formation for several hundred years before hand. 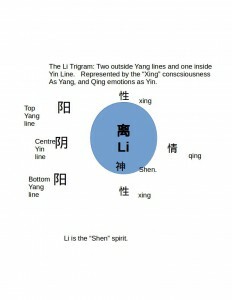 Essentially, Li’s addition was to say that Shen and Xin (heart) are exactly the same thing, so ultimately we therefore take away the understanding that the Shen spirit is made up of Xing and Qing, perception and emotion. What Li wanted to say by this was that it was possible to change the Shen spirit to make it into a pure yang energy, or a pure “Xing” perception. The Qing dynasty writer Shui Jingzi said in his book “Qing Jing Jing Tu Zhu” that changing the consciousness back to pure yang energy was to achieve “Yuan Xing,” or the original Xing. Other Daoists have alternately called this “Yuan Shen” or the original spirit. One unique feature about the understanding of Consciousness in Daoist historical writing is that alterations and additions to theory which were more complete than those that predated them were often widely accepted across many schools, and although each school has its own interpretations of what it means to be conscious, they have all borrowed from each other and gradually created a very large body of theoretical knowledge that can help guide us in our practice of meditation and study of the Dao of spiritual cultivation. Movement, action, knowing, and feeling in Yang Banhou’s taijiquan manual. Yun, dong, zhi, jue, lai xiang ying. Movement, action, knowledge, and feeling arise in compliance with each other. This is my first post about taijiquan on this blog and in this post I wish to discuss this important principle from the taijiquan training manual “Explaining taijiquan,” by Yang Banhou. First, there are four central qualities disucssed here, those being 運yun: to move 動dong: to act, to move 知zhi: knowledge, to know, 覺jue: to feel, to envision. Note that two qualities invoke the body and two invoke the mind. 運動 yun and dong in modern Chinese refers to sportive activities, but in classical Chinese, these two should be clearly made into two ideas. The first 運 yun, should be inferred as movement itself, like a boat riding on the waves, or a rock rolling down a hill. 動 dong in this case refers to the action of moving, so I interpret this to mean that there are two parts of movement, one passive and natural and the other active and inititated. 知zhi, refers to knowledge while 覺jue, refers to feeling, or becoming aware of something. Together they make up the latent knowledge of something and the process by which is able to be acted on. Wang Yangming, the confucian sage said that knowledge without an according action is not real knowledge. That is to say, after something is genuinely known and understood, it will have been acted upon properly. Together 運動知覺 yun, dong, zhi and jue all make up movement and they all must be used together in order to achieve the correct function of the movement. In the case of taijiquan players, that might be to execute a movement which recruits the full capacity of body, mind, spirit, and action, or to know when is the appropriate time to move in sync with an opponent in push hands combat. 來lai means to come or to arrive 相xiang means to reflect 應 ying means to echo or comply with. Taken together, it means that those four qualities of movement, action, knowing and feeling should all be present in each other at the same time. A simpler way to understand this is that the body and mind must be in harmony during movement. The body both has an internal impetus to move and an external manifestation, a deep knowing of the body and the impetus to manifest movement from the feeling that emerges when the mind commands the body to move. On a deeper level, this phrase is a practical application of the concept of the middle harmony (中和), in which the centre of creation is empty, but all things which emerge from it also never leave the harmony of the empty centre. You might want to take some time to ponder this. Many people taking tea as a new hobby find it hard to understand the core differences between the many types of tea avaialable on the market. Something people often do not ask is how certain teas are meant to differ in strength. We all know that full bodied tastes in tea are the best representation of an individual tea, but certain teas show more of their body when we use less tea. Chinese greem tea is a specific example of this. Green tea is known for its refreshing taste and bright perfumw. If the tea is made too strong, it often shows signs of bitterness, astringency, and too much perfume. Instead of using the usual five grams we need for oolong, green tea can often be made with just a pinch. Another big difference is that most teas are brewed better with the lid on the pot, but green tea is better with the lid off or better yet, just with the tea in your cup. Green tea burns and tastes rubbery if it is allowed to oversteep, so lid off and slightly cooler water (usually around 80c) are better. Another big difference is longer brewing times, with a tumbler of green tea brewing perfectly by the time the leaves sink to the base of your cup, which can often take several minutes. If you use the right heat of water and quantity of leaf, you can rest assured that the tea will not oversteep.